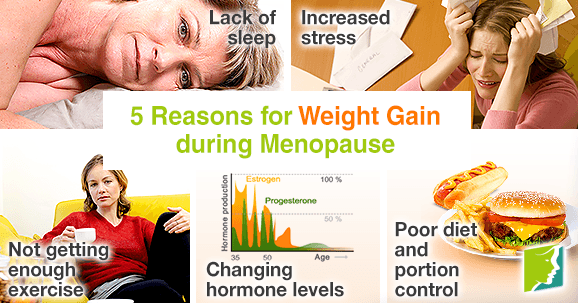 Weight gain is correlated to menopause, but it does not have to be an irrevocable part of a woman's life. Lifestyle habits and the changes that happen to a woman's body during menopause can make her more likely to gain weight during this time. However, there are sustainable and healthy ways to stay fit and active with age. The causes of weight gain are not always obvious. The phrase "eat healthy and exercise" has been given as advice so many times that it has begun to lose any meaning. However, there are some important changes you can make to lose weight and be healthy. Read more about factors that can contribute to weight gain below. Research has shown that getting fewer than five hours of sleep a night or more than nine hours of sleep each night can cause weight gain. If people are fatigued by not enough sleep or spend too much time sleeping, then they do not have time for regular exercise. How much sleep a person gets also impacts hormones, such as ghrelin and leptin, which stimulate appetite. Read more about sleep disorders. Being under a lot of stress can make it difficult to eat healthy and can lead to stress-eating. Many people eat when they are bored, stressed, or anxious, which creates unhealthy eating patterns and leads to weight gain. In order to prevent this, try not to skip meals, especially breakfast. Skipping meals can lead to overeating later in the day. It is also important to only eat when you are hungry. Learning how to cope with the stress and anxiety in your life with tools that are not food can help to lose weight and become healthier overall. Finding a type of exercise you enjoy doing can do a lot to help you lose weight. Joining a gym or participating in a group fitness class helps create a support system of other people who are health-conscious. As a person ages, it is natural for them to have less muscle mass and more body fat. Because body fat uses far less calories than muscle mass does, it may seem like your metabolism is slowing down. This is because you need fewer calories to maintain your body's activities as you get older. A healthy diet includes five servings of fruits and vegetables each day, whole grains, foods rich in vitamins and dietary fiber, and minimal amounts of processed and fatty foods. Studies have found that menopause can add around 15 pounds to a woman's body weight. The long-term health problems caused by being overweight or obese are well documented and include raising the risk for type 2 diabetes, high blood pressure, heart disease, stroke, cancer, sleep apnea, joint pain and stiffness, fatty liver disease, and kidney disease. For these reasons, it is important to be proactive about losing weight and maintaining a healthy lifestyle.